End 'o The Day is a painting by Martin Driscoll which was uploaded on January 15th, 2010. "There came a point in my life when I knew I could paint, but had to give thought to what did I want to paint? This led me to examine my life and remember the joy I had in hearing the tales of Ireland from my relatives, especially my mom. I loved the Irish music and dancing and most especially the Irish people. With the world rapidly changing, I wanted to hold on to some of the memories, so I devoted myself to painting things Irish." Martin Driscoll began drawing as a youth in New York City. In the early 1960�s, after serving in the Air Force, he returned to New York and enrolled in the Art Students League. He studied under Frank Reilly, a renowned teacher who developed a systematic use of the color palette that continues to serve as a foundation for fine art instruction. Reilly�s classes became a cornerstone in the development of Martin�s style. In the years that followed his studies, Martin balanced a career in the airline industry, raising a family, and developing as an artist. He intermittently exhibited at outdoor shows in New York, selling his original paintings and drawings, and accepting numerous portrait commissions. In the mid-1990�s he returned to art full time � teaching painting, giving art demonstrations, and selling his original work. In early 2000, he opened the Driscoll Art Studio, a working studio and gallery aboard the Queen Mary. 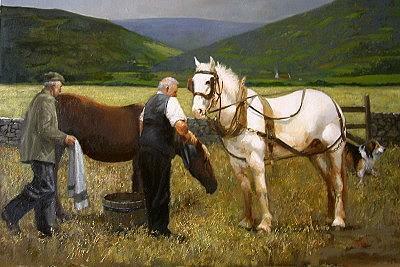 In his studio/gallery, Driscoll�s pastoral scenes of rural Irish life have received particular attention and accolades from collectors and fellow artists alike. Martin exhibited these Irish themed paintings at ArtExpo 2004 and 2005, and his original work nearly sold out. Martin's marvelous Irish Art is now published by Sunflower Fine Art in New York; featuring his brilliant original oil paintings and affordable, collectible, artist hand signed, limited edition giclees on canvas. His ever-growing popularity has seen his paintings displayed in an expanding number of galleries across the US and UK. There are no comments for End 'o The Day. Click here to post the first comment.